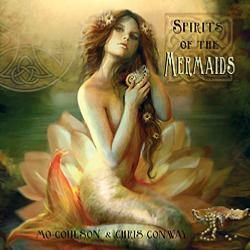 SPRITS OF THE MERMAIDS CD BY MO COULSON & CHRIS CONWAY. Relaxing Celtic music and songs featuring a host of instruments such as Celtic harp, Irish whistles, zither and flute and Mo Coulsons beautiful voice, plus guest players from the Govannen and Red Herrings groups. Follow the story of Melusina, a mermaid who is torn between her life with a man she loves and the pull of her old life in the sea. Mo Coulson Celtic harp, vocals, accordian. Chris Conway - keyboards, Irish tin & low whistles, acoustic & electric 9 string guitars, bombarde, zither, bamboo flute, kalimba, vocals, bodhran, percussion, sound effects.